“You are only as sharp as your knife.” Keeping a favourite bushcraft axe in top condition or maintaining a large amount of teaching knives for the next course; there are a few things we do here at Ember Survival to make sure our kit is performing well. Read our full how to guide on Bushcraft Knife & Axe Maintenance. Most of our tools are an investment. We spend time and money to get great kit and so it only makes sense to invest back into your equipment to make sure it performs as well as it should out and about but also in storage too. We certainly don’t want anything silently rusting on our shelves without us knowing! Some of the substances we use to keep our tools in top order. 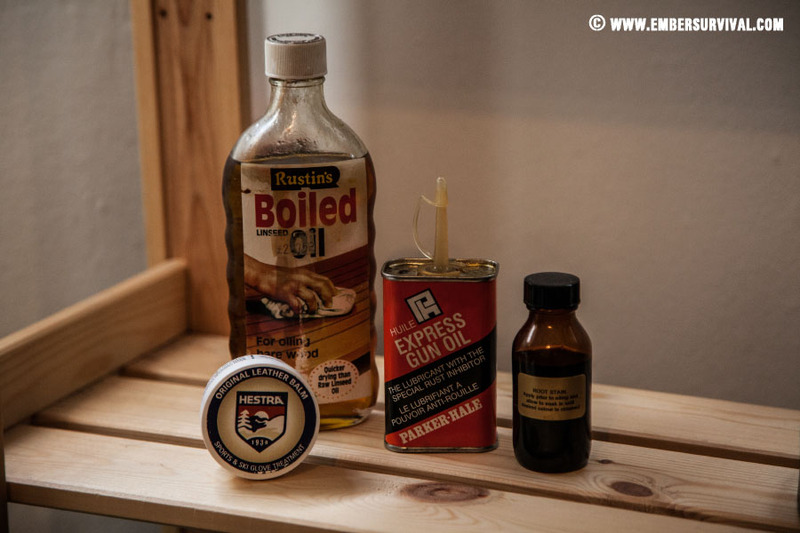 Linseed oil, gun oil, hestra leather balm and root stain. Boiled Linseed Oil is great for applying to any wooden handles you may have on knives or axes. There are some differing opinions out there but what we do is apply a thin coat, taking care not to get any on the blade itself, and then leave it to soak in. We also make sure to carefully apply some between the contacts of the metal and wood, this helps seal it all up. Now depending on how dry the wood is we may need to apply another coat. However if the wood is not absorbing any more we rub off the excess with a kitchen towel. Anything coming into contact with linseed oil should be promptly disposed of in the fire and not binned. Gun Oil is what we use for our metal parts. Be that carbon steel, stainless or even cpm s30v! Apply over the metal and let it dry in a safe place. Gun oil is great for removing any light stains on the blade and drives away moisture to prevent rusting; just try not to get any on the wooden parts. 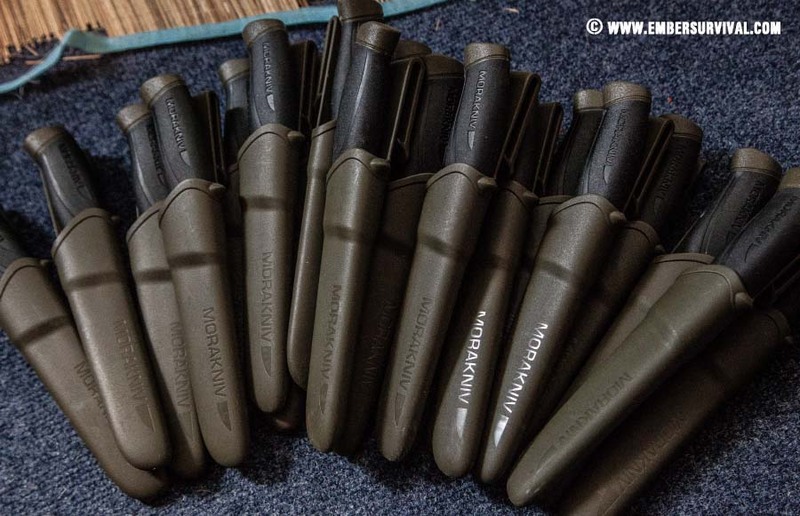 Essential for looking after bushcraft gear. Root Stain is something a bit more exotic. We use this product to darken our wood, particularly on our bushcraft axes. The stain is absorbed by the grain and reveals the beauty of the wood a little better than normal. Apply a liberal coat and let it be absorbed, repeat as desired. Once that process has completed you can add the linseed. Hestra Leather Balm smells amazing, it’s probably all the bees wax in it! A great natural product, we apply on all our leather items from belts to knife sheaths. This helps the leather stay supple and weatherproof as well as giving it a lovely shine. Makes the leather parts of your bushcraft kit really shine. Gränsfors Bruk Small Forest Axe and Outdoor Axe next to a stropping board with honing paste. 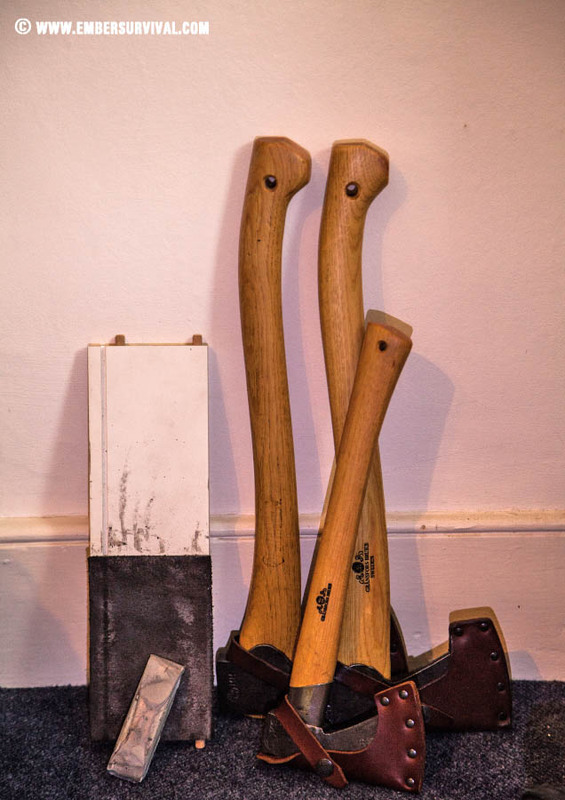 Stropping Kit consists of a square piece of flat leather, a flat bit of wood and some honing paste. Glue the leather to the board and once its dry you can add the honing paste. Honing paste is basically a mild abrasive polish. Stropping the Blade helps preserve the sharp edge for as long as possible without the need to resort to sharpening the knife or axe. Stropping simply realigns the atoms on the edge without removing any metal from the knife; as a result it increases the lifespan of the cutting tool. The stropping action also removes any mild rusting which may have occurred on your carbon steel tools. 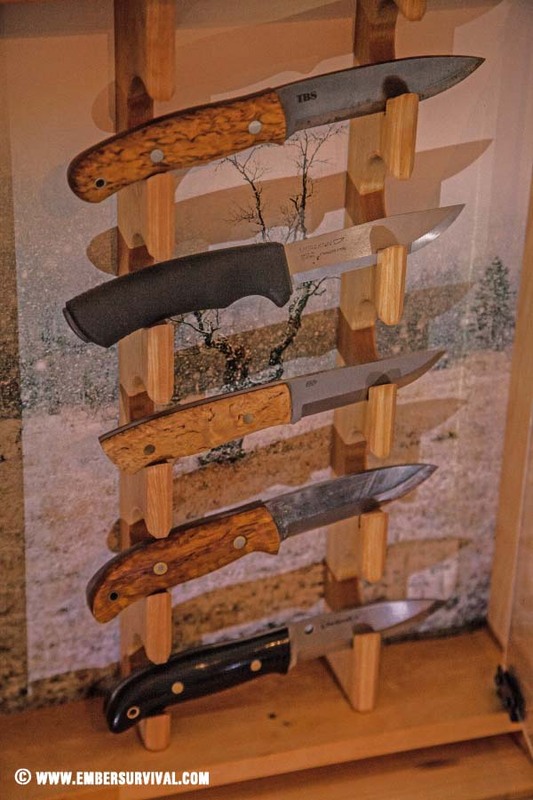 Displaying your favourite knives is important, not only are they kept in a safe place but they are to hand whenever you need them. Storing the Knife. A knife kept in its plastic sheath is no problem. On the other hand leather and fabric sheaths are best left stored separately. The reason is, the knife will slowly distort the shape of the sheath and you may the run the risk of the knife falling out next time you are using it. I recommend to store all the leather sheaths separately and use a specialist cabinet to store your good knives. Storing the Axe is a lot simpler. Just make sure it’s not close to a heat source which could potentially dry out the wood. We store our axes with the sheaths on as the Gränsfors Bruk axes all come with good sheaths which have clips.